Gmail, unlike other webmail services, does not have Blocked Senders or Blocked Email Addresses blacklist option has only recently added the ability to block email addresses. Message from email addresses that are blocked are automatically sent to Spam. To block an email address in Gmail, read the annoying email message from the sender that you want to block, then click Down Arrow to open drop-down menu next to “Reply”, or click on More Actions or More drop down menu, then select Block <sender> option. Then, click on Block button to confirm the blocking of email address to send all email messages from that address to Spam. To unblock blocked email addresses, go to Settings -> Filters and Blocked Addresses. Previously, Gmail users have to rely only on Google spam filter to do its (so far) wonderful works to reject bulk and spam mail messages. So, if you persistently receive harassment email from someone, or a person intentionally send you illicit or sexual materials regularly, you will have to create a filter to blacklist the sender’s name, sender’s email address or if a lot of spammers from the domain, block the domain outright. 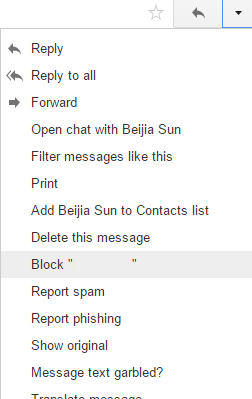 So how to create a filter in Gmail to blacklist or block a sender, sender’s email address or sender’s domain? Gmail provides a lot of flexible way to create the filter, and as it’s a filter based blocking, users will have more choice and option to decide what to do with the blocked or filtered emails, instead of silently discard it or send the mail to spam/bulk folder. 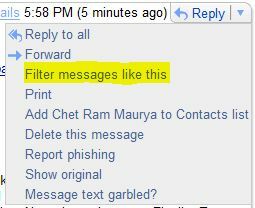 The most simple method to block a sender is by using Filter messages like this option available in new Gmail (newer version 2.0 webmail interface released in October 2007) interface. Read the annoying email message from the sender that you want to block, then click Down Arrow to open drop-down menu next to “Reply”, or click on More Actions or More drop down menu, then select Filter messages like this option. The “Create a Filter” option pane will open with the sender email address is automatically filled in. Verify that the sender email address is correct. You can do a Test Search to see if the correct emails are returned. If you want to block whole domain (e.g. all email addresses that end in such domain, such as @spammer.com, @spamsource.net, @mail.ru), just remove the user part of email, leaving everything behind @ with domain name intact. Then click on Next button. Then choose a prefer action to deal the blocked sender. Since it’s blocked, then we should select Delete it as the default action whenever Gmail receives any email from the sender or from that domain. This setting will automatically move all e-mails that matches the filter criteria to Trash. You can always apply other actions to mails from blocked parties, such as Skip the Inbox or Archive it, Mark as read, Star it, Apply a label (if you trash the email these options is useless, but if still want to review the blocked email messages just in case you may miss out any important mail, apply a label named “Blacklist” or “Blocked” and then archive them is good start), or Forward the email to somebody else. Click on Also apply filter to x conversations below check box if your mailbox already clogged up with numerous unwanted emails from the same sender or domain. Then click on Create Filter button. Voila, the sender is blocked from now onward. This trick combines multiple email addresses wanted to block into one filter. If you already have multiple email addresses added to a special group (such as Blacklist) in Gmail contacts list, Google Operating System (no longer available) has prepared a converter that convert To: field format while composing new email to the filter’s field format, so you don’t have type in every email addresses manually. If you’re still using older version or old version of Gmail web interface (existing version for users on non-English (US) display language), you have to copy the email address, start filter creating wizard, and paste the email address to the From: field.